↑ अ आ इ "Science Express Climate Action Special". ScienceExpress.in. 2017. अभिगमन तिथि 15 June 2017. ↑ तिवारी, सुधीर (९ अप्रैल २०१३). "साइंस एक्स्प्रेस: बायोडाईवर्सिटी स्पेशल". प्रेस इन्फ़ॉर्मेशन ब्यूरो. अभिगमन तिथि १५ जून २०१७. ↑ अ आ "Ninth Phase of Science Express to Criss-Cross India till September this Year Curtain Raiser". Press Information Bureau. 14 February 2017. अभिगमन तिथि 15 June 2017. ↑ अ आ "'Science Express Should Reach Out to more than Six Lakh Villages of The Country': Anil Madhav Dave". Press Information Bureau. 17 February 2017. अभिगमन तिथि 15 June 2017. ↑ "Science Express: A School on Wheels is Coming to a Railway Station Near You". National Geographic Traveller. 22 February 2017. अभिगमन तिथि 15 June 2017. ↑ "Science Express to remain open for all today, tomorrow". The Times of India. Patna. 1 April 2017. अभिगमन तिथि 15 June 2017. ↑ "Dedicated to climate-change, the Science Express flagged". Economic Times. 19 February 2017. अभिगमन तिथि 15 June 2017. ↑ अ आ इ ई उ ऊ ए ऐ "Tour Phase I-VIII". ScienceExpress.in. 7 May 2016. अभिगमन तिथि 17 June 2017. ↑ "Science Express 30 November 2008 to 30 May 2009". ScienceExpress.in. 2009. अभिगमन तिथि 15 June 2017. ↑ "Science Express II tour". ScienceExpress.in. 2009. अभिगमन तिथि 15 June 2017. ↑ "Science Express 2 October 2009 to 27 April 2010". ScienceExpress.in. 2009. अभिगमन तिथि 15 June 2017. ↑ "Science Express III tour". ScienceExpress.in. 2009. अभिगमन तिथि 15 June 2017. ↑ "Science Express: Shaping the Future" (PDF). ScienceExpress.in. 2010. अभिगमन तिथि 15 June 2017. ↑ "Science Express: Biodiversity Special" (PDF). ScienceExpress.in. 2012. अभिगमन तिथि 15 June 2017. 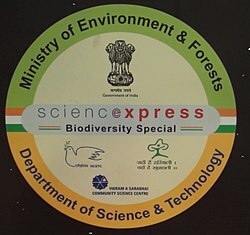 ↑ "Science Express VI: Biodiversity Special" (PDF). ScienceExpress.in. 2013. अभिगमन तिथि 15 June 2017. ↑ "Science Express VII: Biodiversity Special" (PDF). ScienceExpress.in. 2013. अभिगमन तिथि 15 June 2017. ↑ "Route Map". ScienceExpress.in. अभिगमन तिथि 17 June 2017.